No transaction fee when you pay with PayPal. 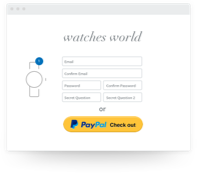 It’s free to use PayPal to shop, and you can pay with your preferred credit or debit card. It’s free to sign up for a PayPal account and there’s no transaction fee to use PayPal for your purchases. There’s only a fee for currency conversion when you shop overseas. You’ll always see what you’re paying. We work with major banks in Vietnam and overseas, so you can pay with your preferred credit or debit card and continue earning reward points. We keep your financial information securely encrypted, so you can shop online with confidence. You can also enjoy our Buyer Protection and Refunded Returns service. Sign Up for FreeAlready have a PayPal account? Link your credit or debit card now. Link your credit and debit cards to shop with PayPal. Add your credit or debit card information to your PayPal account. It’s securely stored. As a standard practice, a USD $1.00 authorisation will be placed on your card. It will be instantly refunded once you confirm it’s valid. Using PayPal to get paid? For receiving overseas payments, you pay a transaction and currency conversion fee. If you’re accepting payments regularly, use a PayPal business account for helpful solutions and discounted rates. Enjoy safer and simpler shopping.